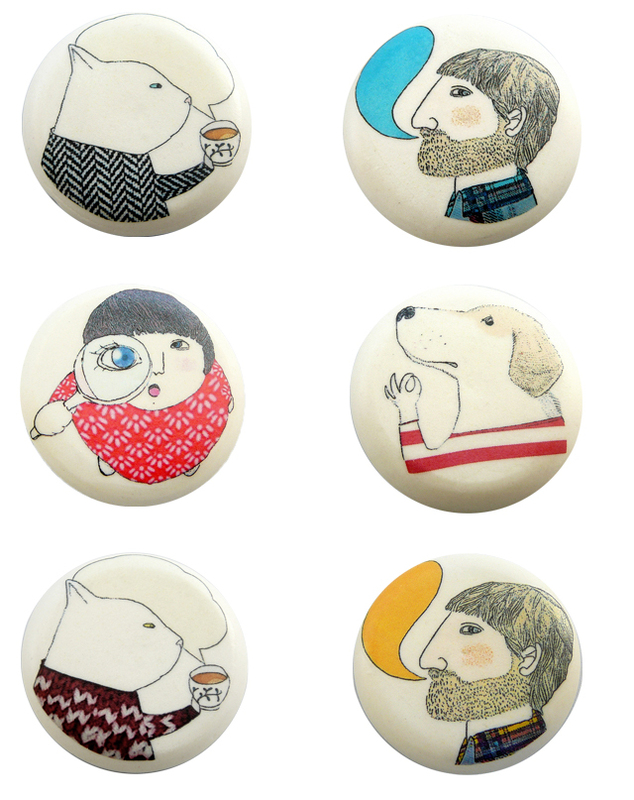 Gorgeous, perfectly quirky porcelain brooches by Atelier Gilet. Nadia, who recently opened her Etsy shop (filled with porcelain lovelies), creates these lovely brooches by applying porcelain decals of her original drawings on white iced porcelain, patiently hand smoothed and high-fired. Aren't the textures amazing? I can almost feel the wool of the cat's sweater! See more of Nadia's work in her Etsy shop, her Flickr and her blog, or connect with her on Twitter or Pinterest. lovely work. best wishes to you. These are really lovely! I love the girl with the magnifying glass, feels like she's looking at me saying "what are you up to young lady??!". Thanks for sharing! Gorgeous! I love the dog! !